WELCOME TO LAKE COUNTY VINEYARDS AND WINERIES! 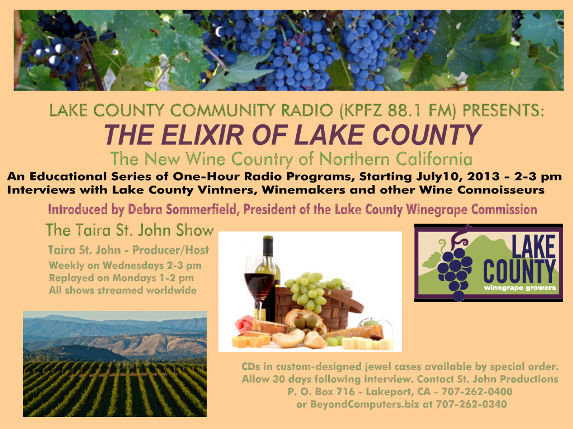 The "Elixir of Lake County: the New Wine Country of Northern California" is a new interview series with winegrowers, winemakers and other vintners. The series was introduced by on July 10, 2013 - 2-3 pm (Pacific) by Debra Sommerfield, President of the Lake County Winegrape Commission and former Deputy Chief Administrative Officer for Economic Development. We look foward to sharing this new educational forum on the Lake County wine industry and how it interfaces with our local econony ecology, environment, tourist industry and cultural development. Lake County is becoming one of California’s most dynamic communities with 36 wineries and hundreds of vineyards and tasting rooms. While Lake County is only two hours from the San Francisco Bay Area, Sacramento Valley and the beaches and cliffs of the Pacific Coast, it is a rural mountain-lake region with the largest natural freshwater lake in the continent and one of the oldest lakes in the western hemisphere, all in the shadow of the mysterious Mount Konocti, an historical ancient volcano. ake County is home to Clear Lake with its unsurpassed fishing, boating and other recreational facilities, it enjoys the state’s cleanest air, spectacular scenic beauty, and unsurpassed hiking. You will also find also find biking, paddling, waterskiing, kayaking, sea plane fly-ins, bird watching, golfing, off-road adventures, rockhounding, and just plain nice people away from the stress of metropolitan traffic. A variety of charming hotels, motels, restaurants, bistros, concerts in the park and theatrical events are contributing to our rapidly developing lakeside artists and writers colony.